Of course, a healthy body needs access to constant and clean water, as that is essential to physical survival. Along with that comes the need for hygienic, sanitary conditions in villages to prevent disease. Our goal is to ensure that both of these become the common occurrence in everyday life, as opposed to the lack thereof, as this is resulting in deplorable living conditions throughout India. Each year, around 37.7 million people are affected by waterborne diseases (viral hepatitis, cholera, jaundice, and typhoid are examples) and about 1.5 million children die from diarrhoea. In addition, India is the largest user of groundwater in the world and is being threatened by rapidly depleting groundwater supplies. There is an urgent need to recharge groundwater, especially by farmers who are its biggest consumers. Our emphasis is to encourage groundwater recharging and to revive rainwater harvesting techniques. India is the largest user of groundwater in the world and is being threatened by rapidly depleting groundwater supplies. From the practical level, contaminated drinking water is a big problem. In Kerala, Odisha, and Rajasthan, impoverished rural communities were provided with easy access to piped water near their homes. Also, in Kerala, the piped water supply is now powered by hydropower. 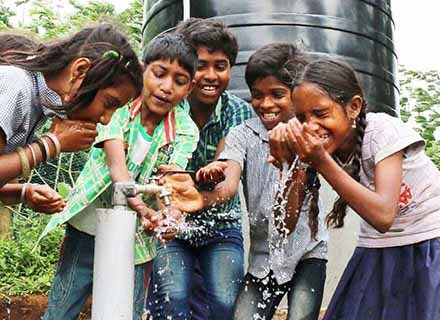 In West Bengal and Maharashtra, we installed borewells for community water supplies. Another crucial challenge in our rural communities is maintaining cleanliness of surroundings and drains in villages. According to the World Health Organisation (WHO), 626 million people practise open defecation in India. In order to begin to provide toilet access, women’s groups in AMMACHI Labs are teaching village women how to build their own toilets right from the base requirements of masonry skills. The construction training that this provides for the women can also lead to a new way to earn money.